with thinly potted flaring sides rising from a small ring foot and very gently rounded up to a lipless rim, decorated on the interior with two large peony blooms borne on slender stems rising from the rim at one side, crossed in the center of the bowl, and with a third bloom rising from the center to the opposite rim, all surrounded by curly leaves entirely filling the background, creating a lush, luxurious design, the lip with narrow plain border defined by a single incised line, the underside with a wider plain border around the rim and very loosely carved with foliage in a continuous frieze, covered inside and out with a fine translucent olive-green glaze with glossy surface, the glaze gathering in the carved and combed lines of the decoration to show a darker tone, giving depth and definition to the design, the neatly pared footrim wiped clean of glaze and the exposed stoneware burnt yellowish-brown in the firing, the recessed base with a splash of glaze. 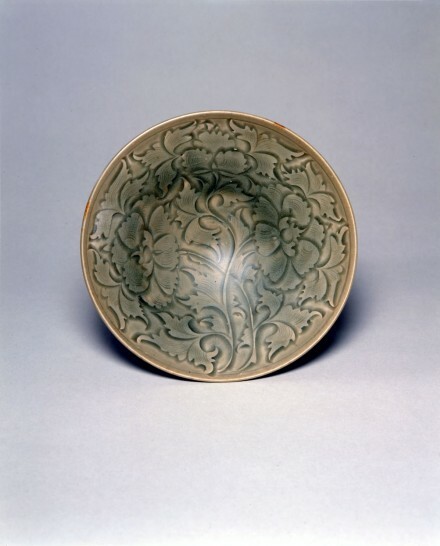 A smaller carved Yaozhou dish of closely related pattern in the Fitzwilliam Museum, Cambridge was included in the Oriental Ceramic Society special exhibition and illustrated the catalogue entitled The Arts of the Sung Dynasty, London, 1960, pl. 51, no. 134, described on p. 57.